Like to make the jump from civilian to officer in one step? MPs editors listened unbelievingly to Army ads and then sent their correspondent to check. Here’s the inside story he brought hack from Fort Riley. YOU’RE walking down the street and a big-business man stops you. “How’d you like to join my organization as a junior executive?” he asks. “Executive of what?” you probably say. “But I have no experience,” you start to protest. Would a conversation like that interest you? It probably would—and you can get in touch with that gentleman any time you want. He’s your nearest Army recruiting officer and the offer he’s making seems so unusual that the editors of MI sent me to check on it. In brief, the offer is that you, a civilian, can now join the Army as a full-fledged officer. This is quite an offer—as many GI’s who spent years in the ranks without a chance at officer’s training will assure you. My first stop on the Mechanix Illustrated investigation was Washington, D. C.—the Pentagon Building. There, I learned that the program is open to all men, married or single, between the ages of 19 and 28. You must have a high school education or its equivalent and be able to pass an intelligence screening test. I was determined that first I would check on one aspect of the program that had bothered me. A recent ruling prohibits the return to civilian life of officer candidates who fail to pass the course. If this program is not simply a ruse to get quality enlistments, why keep the unsuccessful candidates in uniform if they are unwilling? Especially since you must enlist for a three-year term in order to be accepted. That was the question I asked. It keeps you on the ball, they told me. You can’t just drop the course and return home as your only alternative to staying in school is to go into the ranks as a private. While this looks like a rough ruling, a couple of candidates told me that it is a life-saver. After four months of classes, field work, physical training and drill they were fed up. It was at this point that some of their civilian predecessors had washed out in favor of home and family. Faced with three years of training in the ranks, these boys kept plugging in school. And now, with lieutenant’s bars on their shoulders, they are glad they were forced to stay at it. However, many wary individuals will probably still look upon this ruling as a definite drawback. A big topic of conversation around the Pentagon Building is the new school itself. Located near Fort Riley, Kansas, ft represents all that the Army has learned in the training of officers. Before starting the school, the old Officer Candidate School of World War II was put under scientific observation. It was probed, psychoanalyzed and subjected to surgery. Many courses with no more to back them than military tradition were eliminated. Technical courses that had been mere introductions to the subject matter were expanded to mean something. Biggest changes as the result of the scientific survey came in the bolstering of courses in applied psychology, personnel administration, self-appraisal and etiquette. The old phrase—”an officer and a gentleman”—was dusted off and given new significance. Instead of the old O.C.S. 90 days of training, the new A.O.C. (Army Officer Candidate) school lasts six months. And instead of having several schools scattered around the country, the Army has just one. Besides training civilians, the school also trains candidates selected from the ranks. The first few classes were drawn largely from the ranks. Now, the need for officers has become so acute that civilian sources must be tapped. Since January, a class of more than 200 has entered A.O.C. every three weeks. By now civilians comprise about 50 per cent of each class. When you are finally accepted for the new school you do not report until there is a definite place for you. Then you are given two months of basic training at Fort Riley so you can compete on an even basis with classmates who have had previous military experience. During this basic training you receive the pay of a sergeant —$115 a month. This is the same pay check you draw during your six months as a candidate. The rank of sergeant is yours from the time you report for basic until you graduate as an officer. 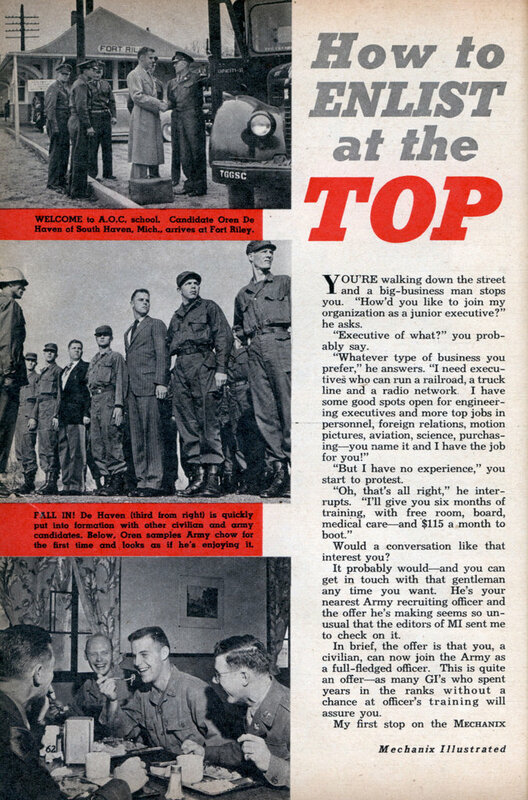 Men from the ranks are also sergeants while in school—but all are addressed as “Candidate.” Enlisted men who fail the course revert to the rank previously held. After hearing about this wonder school, I flew out there in order to give you a first-hand report. Fort Riley is as beautiful a post as there is to be found in the country. It has an air of comfort and security that gives the officer candidate something to look forward to. But look forward, he must. This solid comfort is not to be his during A.O.C. The school itself is located at Camp Forsyth, a war-built training adjunct to Riley, located on the treeless flats of the Republican River, a mile from the main post. The barracks, mess halls, classrooms and administration buildings are examples of the type of wooden structures rushed together during the war. If you are typical of the candidates with whom I talked, you will not have much time to notice meager surroundings. The reason lies in a 55-page book, each page single spaced and a foot long, which outlines every minute of the 960 hours you will spend in class, physical training, field work, drill and practical demonstrations. But, let’s follow you through the school. From the instant you show up at Camp Forsyth you are under inspection—even during your sleeping hours. Col. Robert Lutz and Lt. Col. Elwood Spackman, who head the school, know more about you and your potentialities than any school heads you have ever encountered. Within a week, Maj. Read, Battalion Commander, and Maj. Wood, Operations Officer, will know your exact standing in your class. Then, each of the 110 instructors you’ll encounter will have something to say about you and your grades. Your tactical officer is usually a lieutenant whose course is not so far behind him that the details are forgotten. There’s one of these “tact” officers to every 50 candidates and he has you under observation from reveille to taps. He watches the way you fall in for morning inspection and observes your manners at mess. In class he takes notes on your recitations and the timber of your voice. He’s always making notes. Most important of all, you must pass the inspection of your fellow candidates. The Army has perfected a “Buddy System” to accomplish this which out-Buddies any system you’ve ever run across. Since an officer is an executive who must appraise men, the Army says, part of your training will be to appraise your fellow candidates. Three times during your six months in school you will write a confidential report on each of the candidates in your platoon. After your estimate of a candidate has been checked against those of other candidates and counter-checked against reports of school officials, the Army should have a fair idea of your ability as well as his. Here again you’ll probably feel some resentment. There’s no doubt that it’s a super-spy system and anyone lacking in qualities desired in an officer will find it impossible to conceal his weaknesses. But on the other hand, if you’ve got the stuff these reports will protect you from being washed out by a snap decision. And in the final analysis, every body will be served best if the weak links are eliminated before it’s too late. By the time you complete your course, the Army will have spent about $17,000 in cash on your training and hundreds of valuable man-hours of instruction. In return, the Army will expect to gain a competent officer. While I was investigating this new Army plan for MI, I figured I might as well get a few figures straight on the retirement plan. And Brother, it really had me drooling. You can retire after 20 years of service at half of your base pay. Or in thirty years at 75 per cent. Let’s say you’ve worked your way up to colonel (quite probable after 30 years as an officer). Your monthly pension check would come to around $400. In order to collect that same amount after 30 years of work as a civilian, you would have been paying $200 a month all during the 30 years! So, when you start weighing the possibility of joining up, make sure you put some of that pension gold on the scales. My investigation of this plan for training officers revealed the bad points as well as the good. Admittedly, from your civilian point of view, there are drawbacks. Probably the major one is that—officer or enlisted man— you’re in the Army for a three-year hitch. And of course, there’s no denying that the course is rugged—the Army made it that way on purpose. But there’s also no denying that the Army has put its cards on the table. The opportunity to serve your country as an officer is actually there. You must decide for yourself whether you want to take a shot at it—it’s a big decision to make and neither the Army nor MI can make it for you. So, check the balance carefully on your own books. Then, if your answer is yes, you’ll be able to do something which GI’s and civilians have dreamed of doing since men started making war—enlist at the top! My equivalent pay in the 1970s (in Canada) was about $360/month. I paid for my barracks and my messing (food) out of that, other then when I was in the field or aboard ship. We used to joke it was $0.50/hr, 24 hours a day, and they damned well wanted their 24 hours worth out of you. As a corollary to Daniel’s comment: It’s surprising they’d run this feature article when half the US men were back about five years from WWII. Rick Auricchio: Three years, I think you mean. 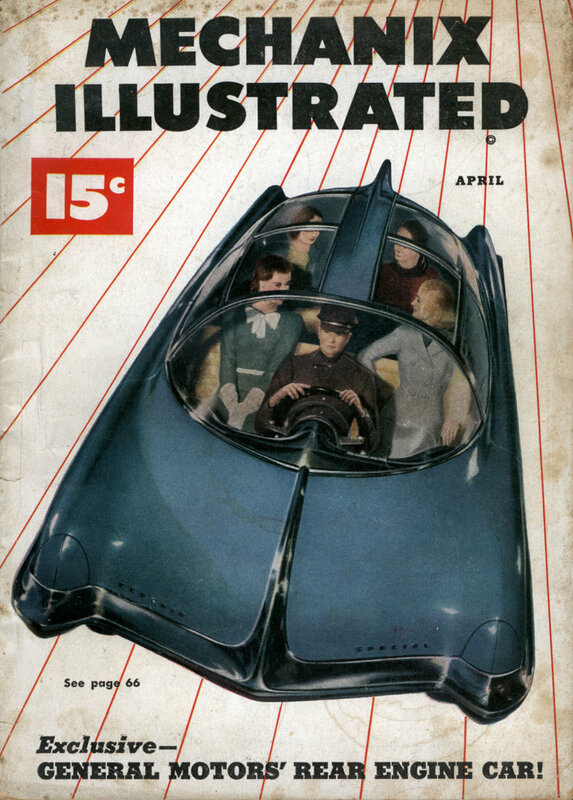 I’d like to see the cover story from this issue about GM’s Rear-Engined Car. I think by 1949 the post war depression was letting up but re-upping might have looked pretty good to a lot of ex-draftees who were out of work. Also, if you got drafted rather than signed up, even with a college education, you might not get officers stripes. Arglebarglefarglegleep: True to form. Officers don’t wear stripes, Sergeants do. But thanks for playing. Only “since the invention of gunpowder”? The Imperial Roman officer corps would take exception to that.